I will try and answer your kind letter at once. I know I ought to have written to you long ago, but writing seems so hard for me. I feel so weak in my back. I have been quite poorly all winter and spring. Will and the children have been well. Katie goes to school every day. Albert goes to Sunday School with Katie every Sunday. Albert has his hair cut, it makes him look more like a boy. I was glad to hear that little Elnora is so well and growing so nicely. How many teeth has she? This will be only her second summer which some times is worse than the first if they have not many teeth. Dear sister, how is the weather down there? Here it is beautiful. The nights are quite cool but I don't think there was any frosts. Have you had any frosts up there? William has no work. The furnace is not running steady. Just now it is not running at all and they have not made any good iron yet. Seems it started last week. They were afraid it would blow up for them. A number of men were hurt but not seriously. Now they are cleaning her out to see what is to be done. They think the man that is running her don't understand how to run a furnace and not other work, there seems to be here in Dover [sic]. Is work plenty up there or does it seem rather dull? I suppose it was quite a surprise to you to meet Aunt Barbery and Fannie and daughter. When you write to them give them my regards. I am also trying the remedy you wrote to me, taking dry salt. I don't know yet whether it will do me good or not, but hope it may do me some good by keeping on taking it. I also take my medicine with it but in small doses. Now I will close writing, hoping to hear from you. Dear sister, I suppose you will think I can fill a sheet of paper like this at once but I cannot. This took me four days until I finished it. Tena has left her descendants a mystery with this letter. Who the heck is Aunt Barbery? Barbery, as we have learned through talking to older relatives, is a nickname for Barbara. It seems to be in common usage in Ohio, but I don't think I've come across it elsewhere. But I have not a clue as to who this woman is, nor Fannie. Barbara was a common name in William Weinsz's family, so perhaps Tena is referring to his aunt, not hers. On the other hand, we don't know too much about Tena's mother's family, so Barbery could be related that way. We will have to remain especially alert if/when we find records of a Barbara who could be a relative. And little Albert got his first haircut. I don't have a date for this photo, but clearly it is after he got his hair cut. 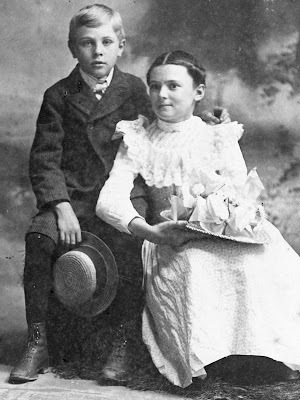 He is here with his sister Katie, and I'm guessing this might be an Easter photo, or spring anyway, because of Katie's light colored dress and pretty hat. Back to Will's work again or lack of it. It's hard to imagine a time before Unemployment Insurance, Workman's Comp Insurance, workplace safety rules, etc. 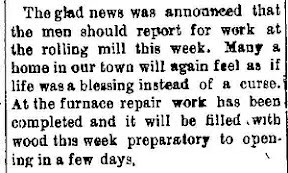 If the furnace (iron mill) wasn't running, the men didn't get paid. I know Tena said they were cleaning out the furnace, but with dynamite??? ?